Well apparently I just wasn’t looking hard enough – here’s someone reading six-button controllers back in 2012 with Arduino. Page is in Russian, and doesn’t have my hot-swapping support, but he does have code examples. I’m having issues though, not sure if it’s due to noise. My controllers are cheap clones I bought years ago for this purpose (although the idea was to hack them to direct key presses and wire them to an old keyboard), so noise is a real possibility. The problem is that, from time to time, the controller goes crazy and just stays that way, sending constant button presses. Reset doesn’t help. Maybe, due to noise or to the fact that physically it is possible to press both up and down on these clone controllers? Do you think I should add some pull up/down resistors to the circuit? Glad the circuit works for you. The input pins are already pulled high with internal resistors, so I doubt that’s a problem. Is it possible there’s a short in how you’ve wired your circuit? Does it work with official controllers? My guess would be that there’s something off in the clone controllers. You could try modifying serial sketch to report the direct pin readings (not the button mappings) and see if maybe a button is getting stuck or shorting. Id love to see this with direct outputs instead of USB – for use in jamma projects – is that possible? I know the arduino has less outputs than you’d need…but seeing as its just direct outs, could you use a standalone output AVR? It wouldn’t be that hard to modify the code to set output pins high and low with button presses – if you just wanted one controller you could probably repurpose the remaining pins on the one Arduino. I only had a few controllers to actually test (all official), but what you’re seeing is the six-button joystick trying to tell the game to switch to six-button polling (why you see Up and Down at the same time). My sketch detects that and switches to six-button polling automatically and but remember it also checks this on behalf of two controllers, one after another. For some reason the controller is not happy with the timing and so keeps spamming the game to switch. Everything here is timing based, and the various delay values I used were found via trial and error, tested with official controllers, and unfortunately, only one controller connected at a time. My guess is that the timing values I settled on, that worked with the chips in the official controllers, are slightly out of sync with the chip in the unofficial controller. What you’ve done is disabled the auto-detect and forced six-button polling for both players, which in effect has altered the timing. While this works, it means you lose the benefits of the auto-detect, and three button controllers will report random incorrect button presses. A different solution would be to alter the timings by experimenting with the delay values (especially the final delay in read6buttons) to get everything to work without losing anything. Alternatively if you’re only ever playing single player, you could set PLAYERS = 1, but that might be too drastic a timing change. Let me know if you try changing the delay values and what numbers you come up with. I’d love to have a sketch that supports the variances in controller chips out there. I checked this value with three different unoficcial pads. new one works with 1350 stable. First thanks for your efforts here. I have used it with success with a Pro Micro. I say success but actually it is partial success. I bought some six button controllers off eBay which unfortunately appear to be about the only ones you can get these days and I cant get the six buttons to work. I have a real megadrive and I used these with Mortal Combat and the six buttons do appear to work ok with this game. In three button mode no problems. If I force six button mode I see what you described in your first post where I get multiple key presses with up, down etc. I have tried varying the timing in small increments and grossly but it seems to make no difference. Indeed the three buttons continue to work no matter what timing I use? So I will keep tinkering but I thought I would say thanks and also see if you or anyone else reading this has any ideas or experience with this crappy controller. The controller link follows. I pulled it apart and there is nothing in there except for what I assume to be an IC under a black circle? This is really great stuff, thank you for this. I am using this tool to troubleshoot some erratic behavior by various 6-button PCB’s, which seems to be triggered by removing them from their native housing and wiring to external controls. Hoping you can look at the info and see some clear fix, because it’s rather frustrating. Issue occurs on a MK-1470 official 6-button controller, and on a SG-6 3rd party controller. The issue does not occur on a MK-1627 (MK-1627 works perfectly when wiring up to external controls). Others have reported the same issues across multiple PCB’s, although I don’t know what PCB’s those are, and I presume these are also the issues Egar reports above. 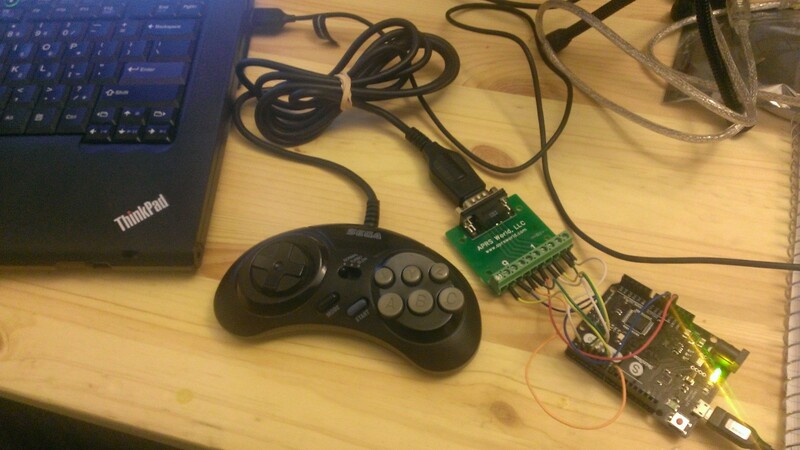 Once wired up to external controls (wires soldered to pads on board, then connected appropriately to external buttons and joystick), the PCB will “ghost” x and y button presses randomly and intermittently while in game. I can sit there with my hands nowhere near the controller, and a x or y button press will occur randomly and intermittently, with no apparent regular frequency. In the case of the MK-1470, it would also start up in 3-button mode randomly and intermittently, without the mode button being pressed. The SG-6 does not appear to have that problem. I tried replicating the issue using your tool. I did not yet have it when working on the MK-1470, but have been testing with the SG-6. I had to change the delay timing to 1800 in order to get away from U/D spamming, but once the timing is set to 1800 (also tested up to 2000, with success), the controller acts perfectly normal. I can do everything in my power to try to trigger the x/y ghosting with no sucess. I let it sit for minutes, wherein it would have ghosted an x or a y in-game, and it sits there happily doing nothing. Yes, i have checked all my soldering, and been around all my work with the multimeter, there is no mechanical reason that I can find for this occurring on multiple PCB’s. It’s been a while since I looked at this, and honestly I can’t remember the types of six-button controllers I used when I first built this sketch (I think they were official Japanese controllers). If I were to revisit this code (other than posting it to GitHub for easier versioning) I would probably try re-implementing the logic based on the info on Sega Retro.